1913 Jan: S.S. No. 14 opened to serve the rapidly growing community of Agincourt. W.H. Paterson donated three acres of land. 1914: Four-room brick building erected. Cost: $12,000. Initially, only two rooms needed. Trustees decided to offer secondary education previously available only in Markham. 1915: Form I (Grade 9) began. 1916: Form II added, thus starting Agincourt Continuation School. 1920: Three years of secondary education now offered. Agincourt students still travelled to Markham for Junior Matriculation until a new high school was built on the east side of Midland Avenue in 1930. Since then, the original schoolhouse has continued to offer elementary education. Pre 1925: One vacant room in the school housed a small book collection for the Agincourt Association Library until the construction of their own building in 1925. 1977: The Scarborough Historical Society put an historic plaque outside the main entrance. 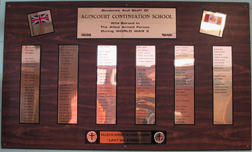 AGI-CS-a (WWII): wooden plaque with attached slim metal panels: Students and staff of / Agincourt Continuation School / Who served in / the Allied Armed Forces / During World War II / 1939 – 1945. Also on metal backing: on the left side of this inscription is a Union Jack (in colour); on the right side of this inscription is a Canadian Maple Leaf flag (in colour). Six columns, consisting of six slim metal panels with names engraved in black. Given names followed by surnames. All names are in upper case letters. Key: Killed in the service of their country / “Lest we forget.” On each side of the “key,” a cross encircled by a wreath. After the Z names, four names appear to have been added at a later date. NOTE: As this memorial includes a Canadian Maple Leaf flag, which was officially adopted in 1965, the memorial was likely made in 1965 or later. Pupils came from a small school named Davenport High School (founded 1920) located in five vacant rooms on the top floor of the Jesse Ketchum Public School to form the first student body for Bloor High School. 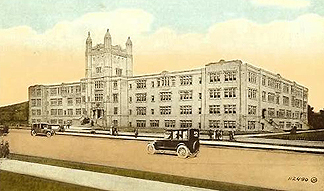 Bloor High School was granted status of Collegiate Institute in October 1925. The original BCI building (started in 1926; opened in 1927) consisted of 15 standard classrooms, one lecture room, physics and science rooms. A separate building had been purchased in 1924 from the T. Eaton Company Limited and converted into a gymnasium. An addition, which now houses the home economics rooms, the library, the biology rooms and shops, was built in 1938. The auditorium, music room, and physics room were added in 1949. The new wing at the southwest corner of the school, consisting of seven standard classrooms, science room and two music rooms, as well as the renovations of classrooms and halls in the original buildings, was started in November 1963 and ready for school opening in September 1964. Published history: BCI Banner Jubilee, 1974/75. [yearbook]. BCI-SS-a: (WWII) Bronze “ 1939-1945 In Memoriam.” At the bottom: “Their name liveth for evermore.” First names followed by surname. BCI-SS-b: (WWII) A-K (part) Framed, under glass “Roll of Honour, 1939-1945” with BCI insignia in the centre. BCI-SS-c: (WWII) K (part)-W Framed, under glass “Roll of Honour, 1939-1945” with BCI insignia in the centre. 1892: Two commercial classes taught in the basement of Harbord Collegiate Institute by R.H. Eldon. 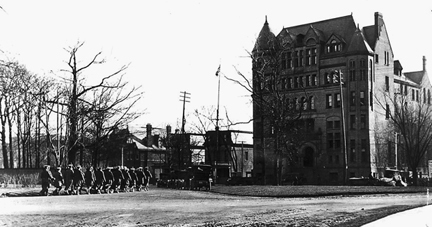 1911 March 16: High School of Commerce used the upper portion of King Edward School. 1911 May 18: New school named High School of Commerce and Finance; to open Sept 1911: Principal R.H. Eldon. 1914: School moved to Clinton Street Public School Annex. 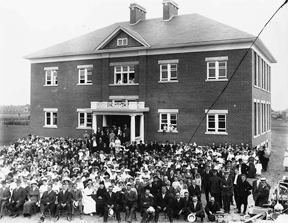 1916 Sept 5: (New) High School of Commerce formally opened. 1931: Grade XII commercial course offered. 1986 May: Gala 75th reunion of more than 3,000 former teachers and students. 1991 Sept: Name changed to Central Commerce Collegiate. Hardy, E.A. and Honora M. Cochrane. Centennial Story: the Board of Education for the City of Toronto 1850 – 1950. Toronto: Thomas Nelson & Sons (Canada) Limited, 1950. Contains references to commercial and technical curriculum development. CCC-SS-a: (WWI) Bronze plaque: “1914 – 1919. In memory of the students / of this school who sacrificed / their lives in the cause of / freedom in the Great War.” Two columns; given names followed by surnames. CCC-SS-b: (WWII) Bronze plaque. Relief decorations include two crossed flags at the top; a torch on each side. “1939 – 1945. In memory of / former students of this school / who gave their lives in World War II. Erected by the staff and students.” Four columns; surnames followed by initials. By 1888, the Association of Stationary Engineers requested a school for technical training in Toronto. In 1891, Council passed a motion “to establish The Toronto Technical School to be located in the St. Lawrence Hall and the anterooms connected therein.” Classes began January 26th, 1892, and were held from 8:00 p.m. to 10:00 p.m. each public school day. Provision was made for 150 students studying mathematics, chemistry, descriptive geometry, mechanics, physics, and drafting. When 307 students registered, it was clear St. Lawrence Hall was inadequate. The school moved to Old Wycliffe Hall. By 1896, enrollment was 1,511. Courses in Domestic Science were introduced in that year and the school became coeducational. By 1900, overcrowding forced a move to the Stewart Building on the south side of College St. (until recently the Ontario College of Art). The first art department was formed by putting a partition across the pool. Sculpture was taught in the deep end of the tank; all other art classes in the remaining area. Day classes began in 1901 with 151 students; night school attendance was 1,710 students. Dr. William Pakenham was principal from 1901 until June 1907. On 19 November 1912, plans, specifications and an agreement to permit the closing of Herrick Street between Lippincott and Borden Streets were approved for the present building. In 1913, the cornerstone of the new building was laid by Prime Minister Robert Borden. Formal opening was Aug. 31, 1915. By 1932, because of an increasing number of aircraft students, the city bought a garage, “the Annex”, at 844 Bathurst Street. During the Second World War, the school operated 24 hours a day. Day students attended from 9:00 a.m. to 3:30 p.m. Emergency classes involving marching drills, wireless operating, aircraft mechanics, tank repair and related subjects were supervised by Royal Canadian Air Force, the Army and the Navy from 4:00 p.m. to 7:30 p.m. Published history: Central Technical School 1915-1990: Reaching for the diamond. Toronto: Central Technical School, 1990. CTS-SS-a: (WWI) Framed printed list under glass: Honour Roll of names of teachers, day students and others connected with the Central Technical School who have enlisted for Overseas Service. At the bottom of the list: Friends are requested to report corrections which should be made in this list; November 23rd 1918. CTS-SS-b: (WWII) A.J. Casson “For King and Country Members of Central Technical School who have volunteered for active service with Canada’s fighting forces.” Eight columns of names. List does not specify which war, but the use of an A.J. Casson document, usually indicates World War II. At the top of the first column, is the heading “Member of the Staff.” Followed by names A-F.
CTS-SS-c: (WWII) A.J. Casson “For King and Country Members of Central Technical School who have volunteered for active service with Canada’s fighting forces.” Eight columns of names. List does not specify which war, but the use of an A.J. Casson document, usually indicates World War II. Names G-M.
CTS-SS-d: A.J. Casson “For King and Country Members of Central Technical School who have volunteered for active service with Canada’s fighting forces.” Eight columns of names. List does not specify which war, but the use of an A.J. Casson document, usually indicates World War II. Names N-Z. CTS-SS-e: A.J. Casson “For King and Country Members of Central Technical School who have volunteered for active service with Canada’s fighting forces.” Eight columns of names. List does not specify which war, but the use of an A.J. Casson document, usually indicates World War II. Names A-Y (possibly compiled later than the above lists). CTS-SS-f: Painted plaster sculpture: two life-sized “classical” figures, male holding sword, draped seated female. The sculpture is flanked by two flags: a Canadian “maple leaf” and the Red Ensign. Enclosed in a semi-circular low, protective screen. At the base of the sculpture is a label: WAR MEMORIAL/by/Alfred Howell A.R.C.A/First Art Director/CENTRAL TECHNICAL SCHOOL/1914-1928. The woman’s face resembles the face of a woman on the Vimy Memorial and may have been sculpted by Walter Allward, a Central Technical student, who also taught in the adult program. 1912 January: Riverdale Branch Technical School “under the direction and supervision of the Principal and Director of the Central School” opened in the Riverdale School—evening classes only. 1922 May 15: Ground breaking by architect C.E. Cyril Dyson, and the laying of the cornerstone about one month later by Dr. John Waugh, representing the Minister of Education. Significant items put into the cornerstone included: program of the day’s events; purple and white colours of the new school and the some of the day’s newspapers. 1923 Sept: Construction completed, registration started for day and evening pupils. School population grew rapidly from 15 to 550. Oct 30: Formal opening. 1929: Fourth-year program added. Dec 10: Board decided to delete the word “Branch” from the sign then being placed on the building. 1930s: School colours change from purple and white to red and white. 1932: Addition. Name changed to Danforth Technical School. 1933: Fifth-year program added. Danforth was now a full-fledged technical school. 1938: Newsletter The Broadsheet established. Published by The Broadsheet Club of Danforth Tech. The school yearbook is the Tech Tatler. 1940: Danforth’s first reported war casualty among ex-students: Lieut. Walter C. Bleaken, wounded at Dunkirk. Army Cadet Corps created as part of the school’s World War II defence training program. Qualified instructors trained several hundred boys; a rifle range was constructed in the basement of the new wing. 1940s: Female students allowed in the shop classes. Items sent to Tech’ers in the armed forces included knitted goods, newsletters, and the Tatler year book. Focus shifted from academics and fun to service and support. Everyone donated time and energy to the war effort. The popular classes in fencing (25 girls; more than 500 boys) discontinued because of the wartime shortage of steel for the foils, sabres, and duelling swords. 1940 June: School sent to former students on active service approximately 185 copies of the Tech Tatler. Students collected “coppers, nickels and dimes” to cover costs. Between June and November, 60 names added to the mailing list. Tatler reported that a committee would record all promotions, casualties, and decorations of Danforth staff and students in the military. Letters to and from enlisted staff and students to be preserved. 1940 Nov 8: School’s Armistice Day service honours James Coleman, aged 19, killed in action in England on October 25; believed to be the first death among Danforth’s enlisted students. And YOU can do the same again. 1940 Dec 20: The Broadsheet described school activities, personal foibles, graduate news and much more, but continued to list names and details of those enlisted for active service. 1942: The Tech Tatler reported that in the fall, and again between Christmas and New Year, the school mailed a total of more than 1,000 copies of the “Special Overseas Issue” of The Broadsheet abroad, along with cartons of cigarettes. Sixty parcels of seaman’s socks sent to those in the navy. Readers were told “the completed questionnaire is our most precious document.” The school had started its sixth volume of letters from students in the services—more than 850 typed pages. Enlisted students reminded to send photos. Teacher W.C. Chantler paid tribute to Flight Sergeant Kenneth Hawkins (graduated 1933) killed in action in the Far East on April 7. A letter to his mother, describing visits to historic places in the Holy Land was published in full, and added to the school’s collection. Including Kenneth Hawkins, 15 names are listed, with further info: attendance dates at Danforth; branch of service; rank; date, place, and circumstances of death. 1943 Oct 15: Air Cadets (formed in 1940) became 330 Squadron. An average of 200 cadets followed the same course as enlisted men in the RCAF, studying administration, aircraft recognition, drill, mathematics and signals. 1948 May 30 (Sunday): Ceremony, dedication and unveiling of the war memorial at three p.m. His Excellency, Field Marshal, the Right Honourable The Viscount Alexander of Tunis, K.C., Governor-General of Canada, presided, accompanied by Her Excellency Lady Alexander. Chairman: W.P. Ferguson, principal. Invocation: H/Major the Rev. John W. Foote, V.C. (The Rev. Foote won his Victoria Cross during the eight-hour long battle of Dieppe “during which he calmly collected the wounded and allowed himself to be captured by the Germans so that he could look after injured prisoners of war.) Words of stewardship: Roy S. Foley, Chairman of the War Memorial Committee. First lesson: Lieut. Victor Killing, RCNVR. Second lesson: Flight-Lieut. Thomas C. Olsen, DFC. Prayer and message of dedication performed by the Governor-General. George A. Arnold, Chairman of the Board of Education, accepted the memorial. Hymns and anthems included: The Lord is My Shepherd; O God, Our Help in Ages Past; O Valiant Hearts; God Save the King. “Last Post” and “Reveille” were played. Special guests included representatives of the next-of-kin of former students. Danforth Technical School: War Memorial, a 35-page booklet with a coloured centerfold of the stained-glass windows, and details of the symbolism, had been prepared under the supervision of Roy S. Foley, chairman of the War Memorial Committee. 1961: West wing added using the Federal and Provincial Technical Aids Programme. The new area could accommodate 440 students: 14 standard classrooms, one welding shop, and a cafeteria to seat 652 pupils. Cost: $1,662,999.72. The Toronto Board of Education contributed only $17,600.00. 1963: Tech Tatler dedicated to Miss Edyth Howison, school secretary (to four of Danforth’s five principals) 1931-1963, and the only non-teaching member of the school’s Quarter Century Club. Miss Howison tracked the progress of staff and students, and developed an extensive collection of clippings and letters, including details of war service and promotions. 1966: North wing added. The Provincial Vocational Grant Program provided 75 percent of the cost. The new area accommodated 492 students in 10 standard classrooms, one typing room, vocational shops, and a double gymnasium. Simultaneously, another addition was built over the existing structure: two music rooms and one drafting room, for 72 more students. 1968 Jan 3: Students first occupied north wing. Nov 29: Formal opening of north wing. 1970s: Music Department expanded to include two new state-of-the-art music rooms; four practice rooms; and a repair room. Inventory of musical instruments among the largest in the city. 1974 May: Fiftieth anniversary reunion. 1980s: Danforth became the only comprehensive school in the (old) Toronto system: technical and academic programs; gifted and enrichment programs; programs for hearing impaired; programs for orthopedic students; new inner-city programs, etc. 1990s: Team name changed from Redmen to Red Hawks. 1998/9: School celebrated its 75th anniversary. Ten thousand former students, staff and guests came—from across Canada; the United States; Bermuda; England; Australia. Composer Douglas E. Wagner created a commissioned piece, Reflections, performed for the first time during the celebrations. Danforth Tech Society (made up of alumni) decided to refurbish the memorial library, including the stained-glass windows, and the leather on the doors, which had become scratched. Eventually $20,000 was raised. 1999: Danforth Tech Society Alumni Association formally organized. Part of the mission statement—the preservation of World War II archives to government standards. 2001 June: Danforth Tech Society organized the Art Show & Sale to celebrate artists who graduated and/or taught at the school. Twenty-two current students and 34 graduates from as far back as the 1930s displayed their work. 2003 July 2: The stained-glass memorial windows (12 panels) taken to Robert McCausland Limited, Etobicoke. 2006 Nov 11: Cadets from 330 Danforth Tech Royal Canadian Air Cadet Squadron took part in an all-night vigil at the cenotaph on the grounds of East York Civic Centre. 2007: The winter edition of Tech Talk reported that Danforth Tech Society had purchased a donor brick for the wall of the Juno Beach Centre at Courseulles-sur-Mer, France. The brick to read: Honouring over 2,200 Staff and Students of Danforth Technical School-Toronto, Who Served. A replica brick to be displayed in the school. 2012 Apr 25: Three-alarm fire caused more than $2,000,000 damage. Students completed the remainder of the school year at area schools. Danforth reopened Sept 6.
has details of Danforth Tech’s cadet corps from its 1940 formation until the present. As soon as the Second World War was over, a War Memorial Committee, made up of the Enlistment Committee; some ex-servicemen and women; some teachers; and a selection of day students, began organizing tributes to all who had served. There would be: four Active Service Rolls (flanking the exterior library doors) prepared by Donald L. Howchin, Director of Art; two bronze plaques to the dead (inside the library) designed by Cyril J. Travers; six stained-glass windows, also designed by Cyril J. Travers; two cabinets to hold the school’s war records; a special doorway to the memorial library, designed by John I. Rempel. Roy S. Foley, Chairman of the War Memorial Committee, supervised the preparation of the 35-page booklet about the memorials. Read more about how the students’ information was collected. DAN-SS-a (WWII): Illuminated list designed by A.J. Casson. “For King and Country / Members of / Danforth Technical / who have volunteered for active service / with / Canada’s fighting forces.” Eight columns. Surnames followed by given names or initials. This memorial begins with Abbot, Reginald and ends with Bleeker, Douglas F. and Dyson, Edward A. (and five names not in alphabetical order). Key: Under the heading “Legend,” are vertical lines of five different colours indicating: (black) killed or died on active service; (red) prisoner of war; (tan) decoration; (blue) mentioned in dispatches; (yellow) award of merit. These lines, where applicable, appear on the left side of the names. NOTE: Colours are at times difficult to distinguish, as some have faded. List does not specify which war, but date of school opening, presence of women’s names, and the use of an A.J. Casson document, indicate World War II. DAN-SS-b (WWII): Illuminated list designed by A.J. Casson. “For King and Country / Members of / Danforth Technical / who have volunteered for active service / with / Canada’s fighting forces.” Eight columns. Surnames followed by given names or initials. This memorial begins with Eakins, Robert T. and ends with Lewis, Norman J. Key: Under the heading “Legend,” are vertical lines of five different colours indicating: (black) killed or died on active service; (red) prisoner of war; (tan) decoration; (blue) mentioned in dispatches; (yellow) award of merit. These lines, where applicable, appear on the left side of the names. NOTE: Colours are at times difficult to distinguish, as some have faded. List does not specify which war, but date of school opening, presence of women’s names, and the use of an A.J. Casson document, indicate World War II. DAN-SS-c (WWII): Illuminated list designed by A.J. Casson. “For King and Country / Members of / Danforth Technical / who have volunteered for active service / with / Canada’s fighting forces.” Eight columns. Surnames followed by given names or initials. This memorial begins with Lewis, Haydn S. and ends with Robson, John C. Key: Under the heading “Legend,” are vertical lines of five different colours indicating: (black) killed or died on active service; (red) prisoner of war; (tan) decoration; (blue) mentioned in dispatches; (yellow) award of merit. These lines, where applicable, appear on the left side of the names. NOTE: Colours are at times difficult to distinguish, as some have faded. List does not specify which war, but date of school opening, presence of women’s names, and the use of an A.J. Casson document, indicate World War II. DAN-SS-d (WWII): Illuminated list designed by A.J. Casson. “For King and Country / Members of / Danforth Technical / who have volunteered for active service / with / Canada’s fighting forces.” Eight columns. Surnames followed by given names or initials. This memorial begins with Roder, George W. and ends with Walker, Enid M. and Tod, Jean (staff) Key: Under the heading “Legend,” are vertical lines of five different colours indicating: (black) killed or died on active service; (red) prisoner of war; (tan) decoration; (blue) mentioned in dispatches; (yellow) award of merit. These lines, where applicable, appear on the left side of the names. NOTE: Colours are at times difficult to distinguish, as some have faded. List does not specify which war, but date of school opening, presence of women’s names, and the use of an A.J. Casson document, indicate World War II. 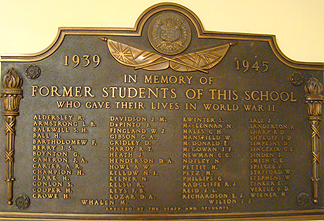 DAN-SS-e (WWII): Bronze plaque: In Memoriam / 1939 Lest We (Danforth Technical School crest) Forget 1945 / Two columns. Vertical sword, in relief, divides the columns. Given name(s) followed by surnames. Across the bottom of the plaque: At the going down of the sun and in the morning we will remember them. This memorial begins with Alexander Craig Aitken and ends with Duncan MacNeill. DAN-SS-f (WWII): Bronze plaque: In Memoriam / 1939 Lest We (Danforth Technical School crest) Forget 1945 / Two columns. Vertical sword, in relief, divides the columns. Given name(s) followed by surnames. Across the bottom of the plaque: At the going down of the sun and in the morning we will remember them. This memorial begins with T. Carl Malone and ends with William A.Youngs. DAN-SS-g: (WWII) Library. The library itself is a war memorial. A bronze plaque reads: On these walls and within this library / is erected our memorial to the former / students and staff members who gave their / lives in defence of their country during / the World War 1939–1945 / Recorded also are the names of those who / served at sea—on the land—and in the air. The ornate door frame is labeled: War Memorial / Library. The padded-leather double doors are secured and decorated with brass studs. Each door has a round window, through which glimpses of the stained-glass memorial (DAN-SS-h) can be seen. Two A.J. Casson memorials are on either side of the doors. The two bronze “in memoriam” plaques are inside the library. DAN-SS-h: Six stained-glass windows. The six windows have two panes each—a smaller window above; a larger window below—for a total of 12 panels. The four outer large windows represent Four Freedoms: Freedom from Want; Freedom from Fear; Freedom of Speech; Freedom of Religion. Each smaller window relates to the “freedom” below it, with subjects such as: The Wise Administrator; The Eternal Struggle; the Signing of the Magna Carta; God the Creator. The two central large windows show: The Student as a Mature Citizen; The Student as a Soldier-in-Arms. The smaller windows above show the Canadian coat-of-arms and the coat-of-arms of the school. Designed by C.J. Travers; executed by G. Smits and F. Ramsdale. 1948. NOTE: All twelve panels of the window are explained in detail in the memorial booklet. We hope to condense some of the descriptions and interpretations later. DAN-SS-i: Two cabinets (inside the library) to house the 35 volumes of records accumulated during the war—letters, photographs, clippings, forms completed by enlisted students, etc. —W.P. Ferguson, Principal. A teacher at Danforth since its opening, Mr. Ferguson had known all of those named on the honour rolls. 60th anniversary book shows the main entrance of Eastern High School of Commerce, Toronto. Type of school: Secondary (Grades 10 to 12); business and technology focus. Motto: Enter to learn, Go forth to serve. School teams are the Saints. Yearbook is The Eastern Echo. 1923 Oct: Students east of the Don River needed easier access to secondary schooling with an emphasis on business and commercial studies. Board purchased 12 lots of land for $42,300. Twelve-room school planned. 1924 July 29: Cornerstone laid by Edmund Gunn. Beneath the cornerstone were placed four Toronto newspapers; data and blueprints relating to the school’s construction; Board of Education by-laws and annual report; a few silver and copper coins. 1924 Oct: Board of Education decided to install coal-burning furnaces in the new school instead of oil heaters, to cut costs. Students voted for a 40-minute noon recess instead of the hour and a half requested by a parent; the shorter lunch break meant a 3 p.m. dismissal. 1925 Sept: When the school opened, only some of the classrooms were ready. No gymnasium, auditorium, or basement facilities. For Physical Training (P.T.) classes, students walked along Danforth Avenue and surrounding areas for fresh air and exercise. Typewriting classes were held in the hall near the principal’s office. Students ate lunches on a plank sidewalk that led to a ravine behind the school, which held a city dump. (The ravine was later filled in with horse-drawn cartloads of earth to become a playing field for school sports clubs, including rugby. In winter, the field became a skating rink.) All classes had to adapt to the noise and movements of building operations. First principal was Walter Keast, who served until 1943. There were 21 teachers and 851 students. 1926-1927: The school’s popularity grew quickly. The three-storey south wing, containing 18 new classrooms was completed. 1927: Students’ Council started. First president: Ernest H. Partridge. 1933: Many students had to leave school to find work because of the Depression. Some returned later to finish and to go on to university. Day school students: 1,713; night school students: 2,200. Notice about the opening of Eastern Commerce, Toronto, from the Toronto Star, Aug. 29, 1925. 1951: First graduates of the four-year Junior Clerical Course received their certificates. 1961 Spring: Six additional classrooms and two music rooms opened. 1961 Fall: North wing, along Chatham Avenue, opened. It held a health centre and new cafeteria. 1966: South wing built. A third gymnasium, a library, a large-group instruction room, data processing room, language lab, and business machines room were added. 1967: Grade Thirteen departmental exams ended. 1973: Subway Academy One, a TDSB alternative school, began sharing Eastern’s building and principal, but otherwise ran separately. 1985 May 4: Celebration of 60th anniversary. Erdman, Wayne. Eastern High School of Commerce 60th anniversary, 1925-1985. Toronto: The School, 1985. unpaged; ill.
EHC-SS-a (WWII): Illuminated list designed by A.J. Casson. “For King and Country / Members of / Eastern High School of Commerce / who have volunteered for active service / with / Canada’s fighting forces. Eight columns. Surnames followed by given names. Key: a red ink cross indicates “Killed in action.” Heading at the top of column i: Navy. Heading at the top of column iii: Army. EAR-PS-b: (WWII) Illuminated list designed by A.J. Casson. “For King and Country / Members of / Eastern High School of Commerce / who have volunteered for active service / with / Canada’s fighting forces.” Eight columns. Surnames followed by given names. Key: a red ink cross indicates “Killed in action.” Heading at the top of column i: Air Force.